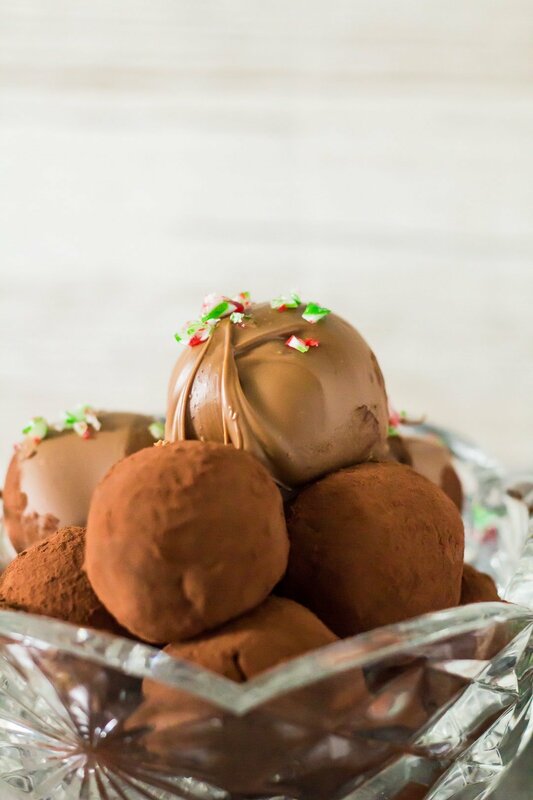 Peppermint Chocolate Truffles – Deliciously indulgent peppermint-infused chocolate truffles that are easy to make, and are perfect for giving at Christmas time! You just can’t beat a super quick and easy recipe that requires A LOT of chocolate. These truffles have a creamy and indulgent peppermint-infused chocolate centre that is sealed in a milk chocolate shell. Sprinkle on some crushed candy canes and you have yourself the perfect edible gift for Christmas! Chocolate: You’ll need 32oz/900g in total. I used milk chocolate, but you can use semi-sweet or dark. 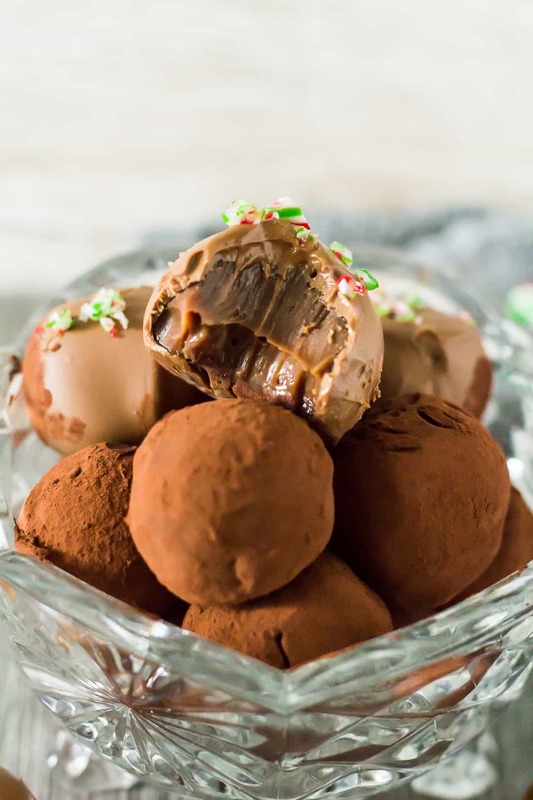 To make these truffles, simply add half the chocolate and the cream to a microwave-safe bowl, and heat in 30 second intervals, stirring after each one, until melted and smooth. Stir in the butter and peppermint extract until fully melted and combined. Cover and refrigerate for at least 2 – 4 hours, or until firm enough to scoop. Roll the truffle mixture into 1oz balls and place them onto a large baking tray lined with parchment paper. Refrigerate for about 30 minutes. Add the rest of the chocolate and the vegetable oil to a microwave-safe bowl or jug, and heat in 30 second intervals, stirring after each one, until melted and smooth. Dip each ball into the chocolate and place back onto the baking tray. Sprinkle with crushed candy canes, and allow the truffles to set at room temperature or in the fridge. 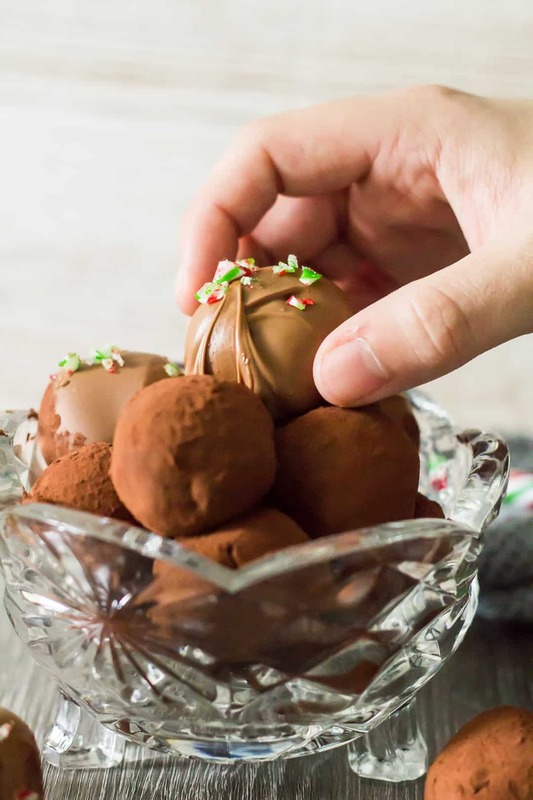 If you don’t want to coat these truffles in chocolate, you can roll them in cocoa powder, crushed candy canes, or sprinkles! How long will these chocolate truffles last? These truffles can be kept in an airtight container, layered between parchment or wax paper, at room temperature or in the fridge for up to 1 week. For a more firm chocolate centre, keep them in the fridge. If you’d prefer a more creamy, melty centre, store them at room temperature. Can I freeze these chocolate truffles? These truffles freeze well for up to 2 months. Thaw overnight in the fridge. More perfect edible gifts to make! 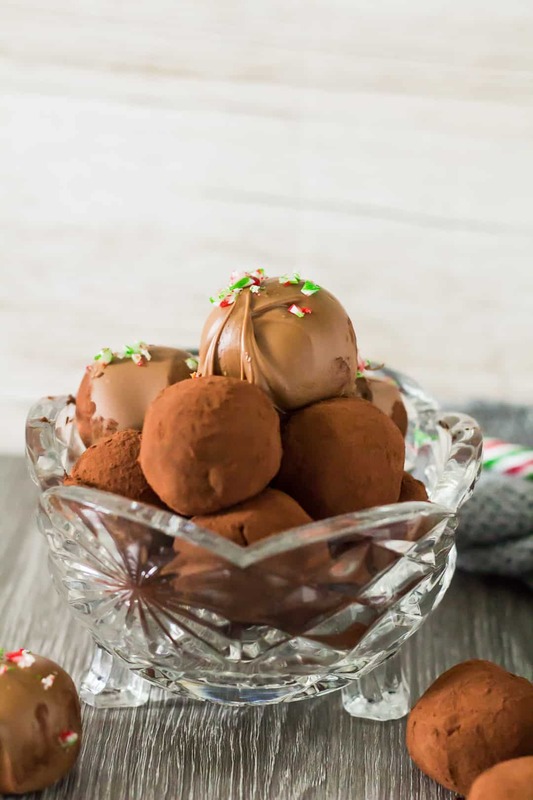 Deliciously indulgent peppermint-infused chocolate truffles that are easy to make, and are perfect for giving at Christmas time! Add the chocolate and cream to a microwave-safe bowl, and heat in 30 second intervals, stirring after each one, until melted and smooth. Whisk in the butter and peppermint extract until fully melted and combined. Cover the bowl tightly with clingfilm and refrigerate for at least 2 - 4 hours, or overnight until firm enough to scoop. Line a large baking tray with parchment paper. Set aside. Roll the truffle mixture into 1oz balls and place them onto the prepared baking tray. If the mixture becomes too sticky, lightly coat your hands in cocoa powder to make the process easier. Refrigerate for about 30 minutes. Add the chocolate and oil to a microwave-safe bowl or jug, and heat in 30 second intervals, stirring after each one, until melted and smooth. Or if you'd prefer, simply roll these truffles in cocoa powder, crushed candy canes, or sprinkles! Truffles can be kept in an airtight container, layered between parchment or wax paper, at room temperature or in the fridge for up to 1 week. They also freeze well for up to 2 months. Thaw overnight in the fridge. 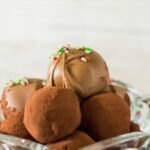 These truffles are perfect for the holidays! They would go great on a Christmas cookie tray! Oh heavens, I am just drooling. I have some cream in my fridge that now knows it’s fate! My holiday guests are going to love these!